HRC is proud to mark World AIDS Day by highlighting the work of our HRC Global Innovators who are part of HRC’s Global Alumni Network. The theme of this year's campaign is “Know Your Status,” and our alumni around the world are working to ensure that LGBTQ people most affected by HIV -- especially transgender women and gay and bisexual men -- are able to access HIV testing and treatment without fear. According to UNAIDS, a quarter of people living with HIV today do not know their status. Barriers such as stigma and discrimination prevent many people from accessing confidential testing. LGBTQ people are especially likely to be adversely affected. “We are proud to be connected with LGBTQ leaders and allies for equality in every part of the world through HRC’s Global Alumni Network. These innovative advocates are leading the way to make sure LGBTQ community members know their status through testing and are able to get treatment,” said HRC Senior Global Programs Officer Jay Gilliam. Read more about the ways some of our HRC Global Innovators are working every day across the world to ensure that LGBTQ people can access life-saving HIV prevention, treatment and care below. "We want everyone to know that recent studies have proven that HIV transmission does not occur when viral load is undetectable on antiretroviral treatment. This change is especially important given that prejudice and discrimination against people living with HIV is still widespread. The equation is simple: U=U. Undetectable equals untransmittable. We want people to spread this message so that we can end the stigma." To end the stigma is important to know that HIV transmission does not occur when viral load is undetectable on ART. This summer, seven HRC Global Innovators attended the 22nd International AIDS Conference to learn from other experts and activists how to strengthen policies and programs and ensure an evidence-based response to the HIV epidemic. HRC Global Innovator Manisha Dhakal said she was looking forward to learning the ways that PrEP can enhance her organization’s HIV prevention work across Nepal. It will take all of us to unite to end the HIV epidemic and combat HIV-related stigma in our communities across the globe. 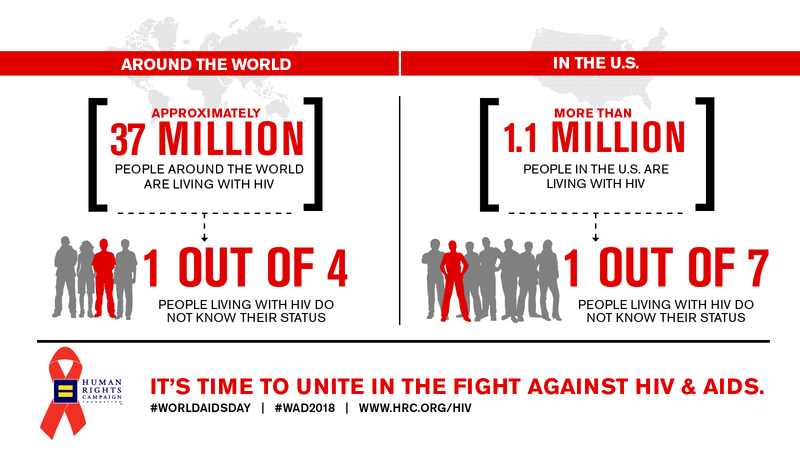 For more information on HRC Foundation’s work to end HIV, click here.